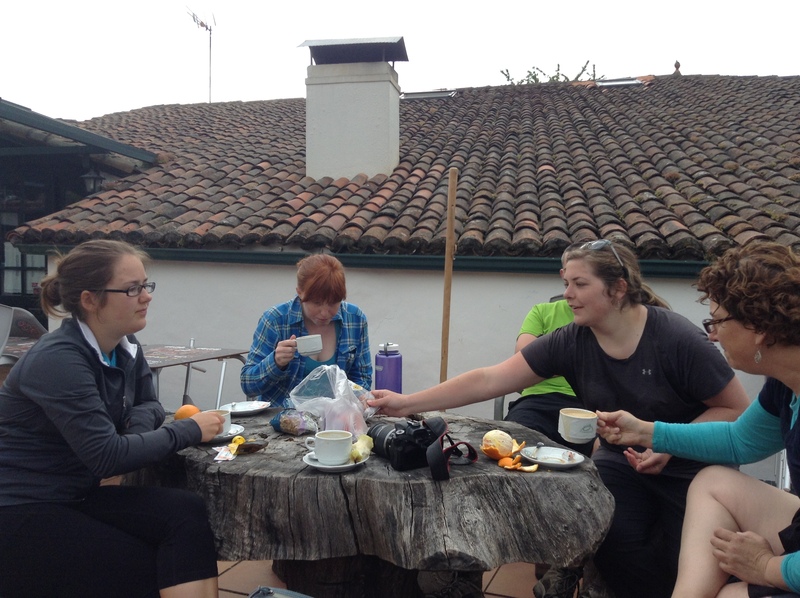 One thing that is very memorable to me about the Camino is the copious amount of delicious food. There is something about walking all day that makes any meal taste good, and therefore good food tastes as if it were sent from the heavens. We would usually start off the day with a small breakfast of fruit, pastries, and yogurt before beginning the day’s walk. 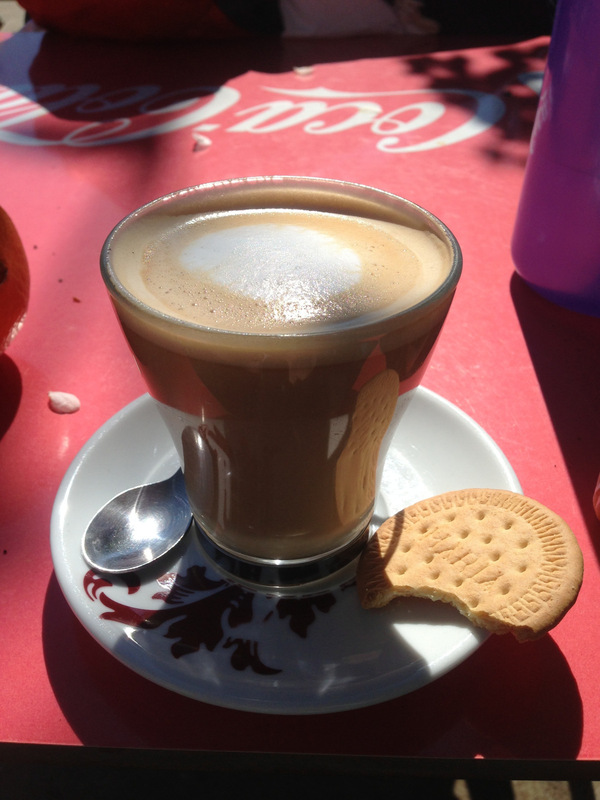 When we started to get hungry and lethargic a few hours in, we would stop for a café con leche, which is similar to a latte in America, and a bocadillo, which is basically a huge sandwich made on half of a baguette (and this is still before noon). When all of us finally arrive at our destination, we would go to get lunch at a local restaurant. This is not your average lunch, however; it is a menú peregrino, which is pretty much a three course meal. For the first course, there was usually an option of a salad, pasta bolognese, soup, or some sort of fried food, such as calamari. The second course generally consisted on a protein (eggs, pork, chicken, eggs, lamb, eggs… did I mention eggs?) and French fries. Bread was also a common staple; we were served copious amounts of bread with every meal. After that, we would have dessert, which could be flab, ice cream, fruit, cake, or arroz con leche. Needless to say, we were fed well. Croquetas are little fried balls that look a little bit like hush puppies, except the inside is a mixture of meat, potato, and cheese. When croquetas were an option, we ordered them. Jamón is Spanish ham, and it is usually smoked or cured. It is an ingredient in most Spanish foods, and is way better than ham in the United States. It is also a bocadillo staple. Arroz con leche is a rice pudding, but better than any rice pudding you have ever had. Tarta de Santiago is a dense cake covered in powdered sugar, and is completely delicious. We also tried our fair share of strange foods, which you would be hard pressed to find in the United States. Pulpo is octopus, which is usually boiled and served with red pepper. I was nervous to try it but found out that I actually love it, and it got better and better as we neared the ocean. Oreja is pig’s ear, which I was conned into eating by my fellow peregrino Mark. I was not as big of a fan of that one. My favorite part about traveling is generally the food that I get the opportunity to try, and Spain has been no different. We have had so much and so many types of food; I am excited to try more. 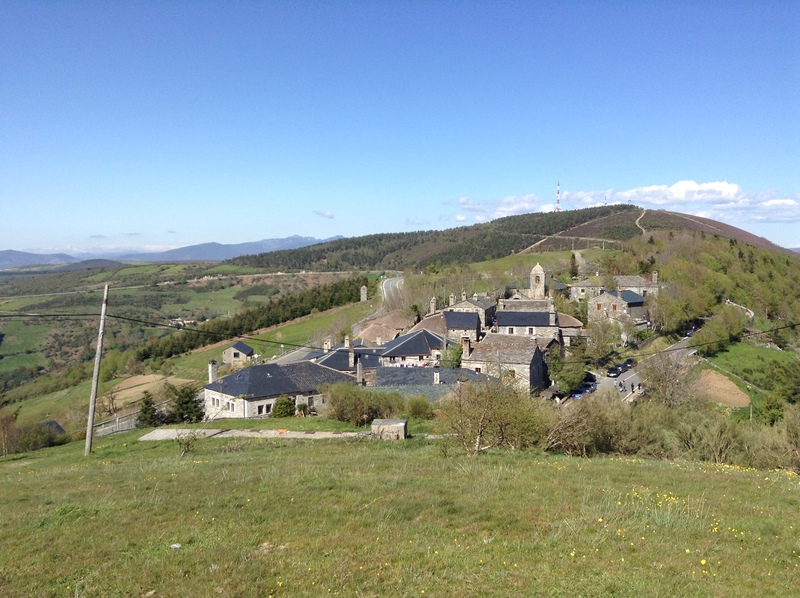 Without a doubt, my favorite village of the Camino was O’Cebreiro. Nestled in the Cantabrian mountains at an altitude of 1300m, O’Cebreiro was the first town on the Camino that was part of Galicia. What’s fascinating about Galicia is that it has a heavy Celtic influence, which makes it incredibly different than any other Spanish region. There is such a strong Celtic presence because in 600 BC, the Celts invaded the region. Not only that, but because of it’s location on the French Camino, it has also been influenced by the millions of northern Europeans who have traveled through the town. The town was constructed in the 9th century, which gave the town a very antique setting. The buildings were all made of stone and had never been reconstructed so the stones that we saw and felt were the same stones that were used in the construction. It is an absolutely incredible feeling to sit in the exact room that was used 12 centuries ago. However, with this sense of awe and admiration came the eerie feeling that the town had to be haunted. Talking about scary stories and horror movies at dinner didn’t help either. By the time I went to bed, I was completely convinced that I was going to be murdered by the ghosts that haunted the town. The hike to O’Cebreiro was surprisingly not bad at all. Rachel and Mike both kept on talking about how difficult and steep the hike was. The hike was definitely steep and probably the steepest thing I had ever climbed, but the scenery that came along with it was beyond anything I have ever seen in my entire life. If a Heaven does exist, I believe the view from O’Cebreiro is what it looks life. I was surrounded by mountains and tasted the freshest air that could possibly exist on the planet. The entire hike was only 16km and took about four hours surprisingly enough. Once the entire group arrived in O’Cebreiro, we gad a delicious Galician meal: Galician soup (it had kale and potatoes), tortilla de patata, and tarte de Santiago. After lunch, Dom and I visited the little church which supposedly holds the Holy Grail. I say “supposedly” because obviously no one knows for sure exactly what happened to the Holy Grail and there are many other places in the world that claim they have this historical artifact. Nonetheless, it was a very powerful to be in the presence of something that has such an impact on history and religion. After the church, Dom and I climbed a hill that overlooked O’Cebreiro. The view was absolutely breathtaking. I could spin in circles and I would be able to see mountains for miles and miles. It reminded me of Julie Andrews in the beginning of the movie, The Sound of Music. That is honestly the best way I can describe the view. Although O’Cebreiro may be a little eerie at night, the culture, history, and scenery of this small village cannot be surpassed. Everything in this town is incredibly unique and would not be found anywhere else. 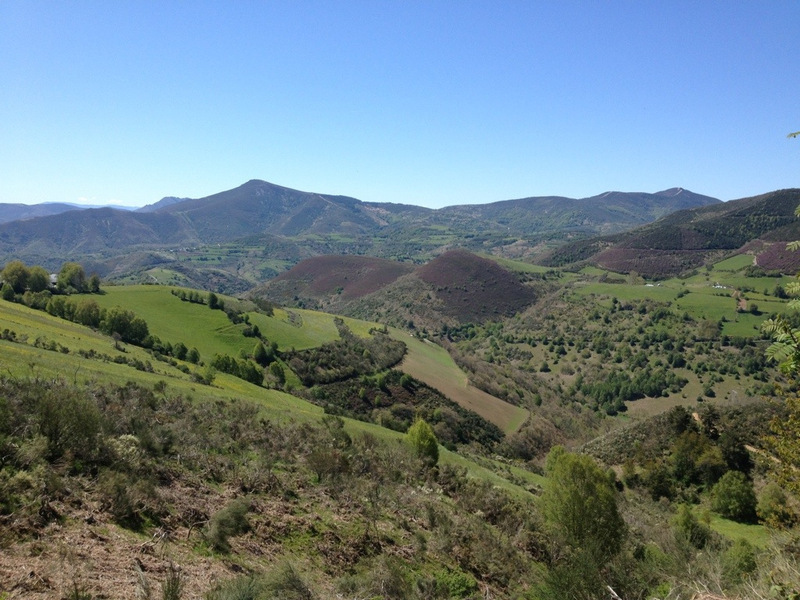 I can’t wait to do the Camino again just to visit O’Cebreiro once more. Today’s walk consisted of 15 kilometers between two very small villages, specifically Ambasmestas to the small village of O Cebreiro. O Cebreiro, one of the first villages you come across as you cross into Galicia, has been able to maintain much if its medieval charm over the years and you can walk through the entirety of the town in about 2 minutes. I decided to walk most of the day alone, which I had not done yet on the trip. It was very different walking the trail without talking to anyone else, and as a result I was able to take in all of my surroundings in silence while completing the physical challenges of the trek. This particular day of hiking involved a steeper incline up a mountain and a very rocky terrain to go along with it. When I say that the strain of the ascent was worth it, it is a gross understatement. The final 5 kilometers of today’s journey provided some of the best views of the trip thus far, and possibly some of the best I’ve ever seen. Towards the end of the day’s walk, we ended up talking to two girls from Germany, one of whom was in a very similar situation as me. She spoke great English and explained that she had just finished her studies and would be starting to work when she returned back to Deutschland. Sounds familiar. Right before we finished walking for the day, I stopped and was taking in an incredible view and snapping some pictures. As the girls passed me, the one with the great English said, “You shouldn’t take so many pictures – you just have to feel it!” I stopped and thought about the comment for a moment before realizing that she was absolutely right. I had been so quick to pull out my iPhone and take pictures of noteworthy sights along the trail that I may not have felt the moment of scene or object properly. Instead of looking at the things through the window of my iPhone camera, I should be living in them and truly feeling the experience. The hike into O’Cebreiro is not the highest one but definitely one of the steepest. The hike started out pretty uneventful and as we continued toward the mountains. 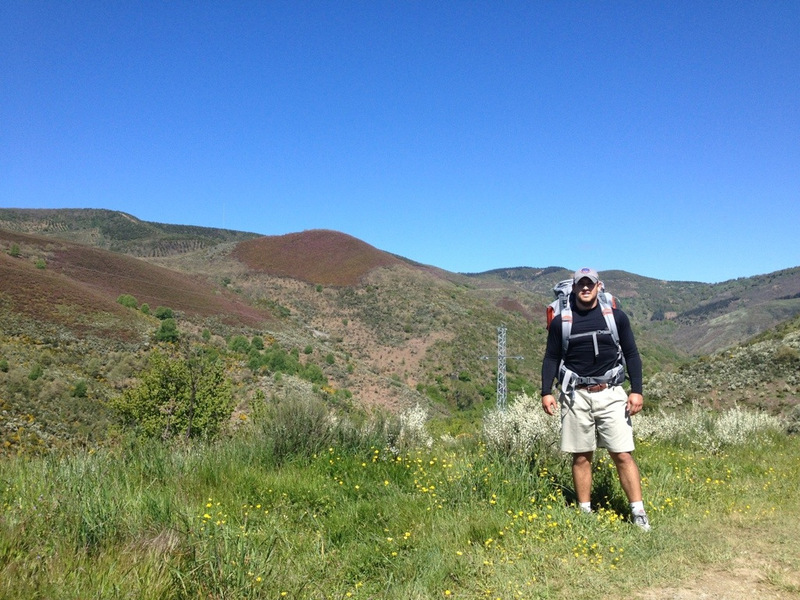 After about 4km the trail started rising and would not stop until we reached O’Cebreiro. The path turns to dirt and is covered in shade by the overhanging trees and is filled with continuous switchbacks as we continued to climb higher and higher. Although other days had taken a physical toll on my body today was the first that tested my cardio. All the hard work was worth it when we broke the treeline and were treated with stunning views of the valley below. 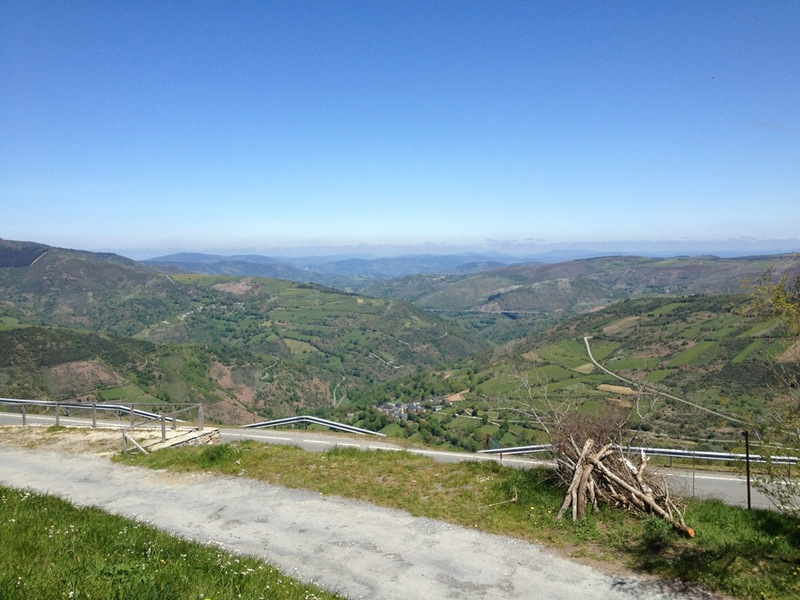 After a final push we cross into the province of Galcia and then to O’Cebreiro. Galicia is famous for its Celtic influence, large amount of rain, and regional language called Gallegos which is a mix of Portuguese and Spanish. Reaching the town felt great and I remember talking to a Spanish man the night before ands he told me when you get to the top you will have the knowledge that you struggled and achieved the great distance and altitude by own personal grit and perseverance. O’Cebreiro is a tiny town from the 9th century. We explored and saw original buildings that had been restored and the local church which they said holds the Holy Grail. 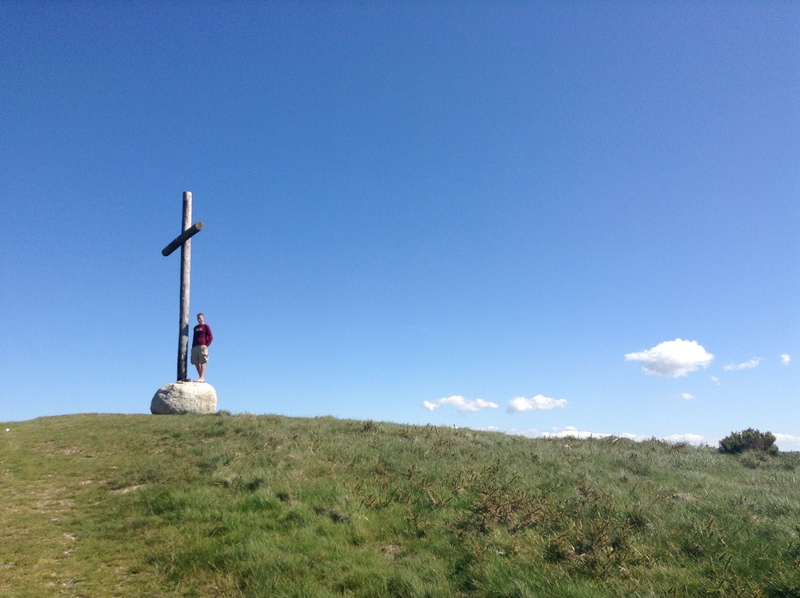 My favorite part of the town by far was the cross located on a nearby peak. I went up there with Alex for the views. The cross was super cool because in the crack people had put coins in, Alec and I left our mark by putting the 3rd and 2nd tallest coins respectively. I love all the traditions and such that have been carried on on the Camino which I can participate in. One of the best parts of my personal Camino was meeting other peregrinos that were not in our group. It was amazing to hear the stories of how each person ended up on this incredible journey and where they came from. One such person was a guy from New York named Patrick. Dom, Jesse, Jack, and I met him in Ambas Mestas outside of the restaurant because he was looking for a Bob Dylan zippo lighter he had left there earlier that day. He ended up finding it, which he was very excited about because he had had the lighter for over 10 years. We all got to talking, and we learned that he was an actor in New York City who was working as a car salesman before he came on the Camino. Because of issues at work and a desire to explore the world, he quit his job and booked a one-way ticket to France to begin the Camino. He arrived there on his birthday, April 26, and started walking. I love the idea of that: leaving your entire life behind to go to a foreign country in which you don’t know the language in order to find out more about yourself. And to do that alone takes a certain kind of strength that I really admire. Because he had no itinerary or plans of any sort, he was able to take his time, stopping for a few days in certain towns or cities and walking until he felt like he wanted to rest. After that night, we saw him in various places and towns as we got closer to Santiago, and his face was always one that we were happy to see. Another day on the trail, Coryn and I decided to stop for a coffee, and sat with an Australian woman and her son, who we soon learned to be named Amanda and Sage, respectively. As it turns out, Sage was an eighth grader, and was taking a 3 month vacation from school in order to do this trip. Apparently, in Australia it isn’t a big deal to take a few months off of school to travel the world. I wish they did that in the United States! Because you learn about so many different cultures and people while traveling, they think that it it worth missing school. He is only 14 and has already been to every continent except the Americas and Antarctica. 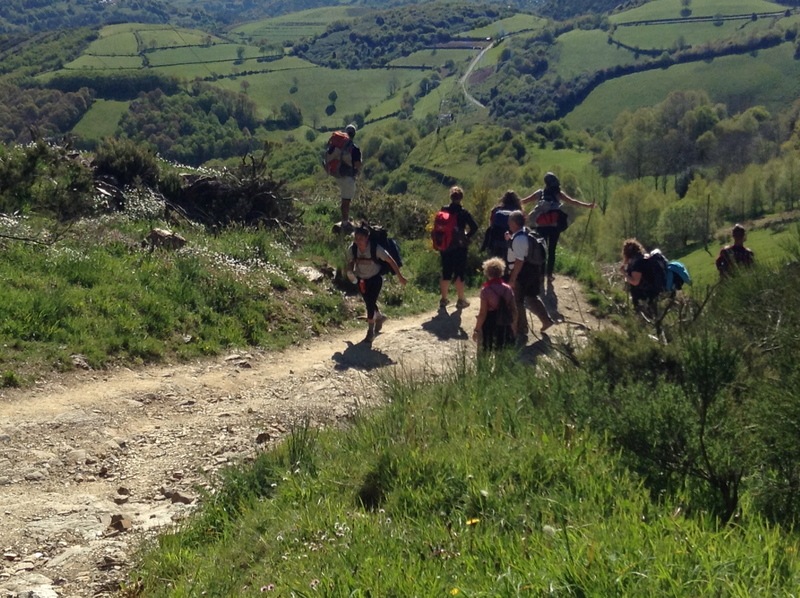 We also saw these people as we continued through the Camino. One of my greatest interests, in regards to careers, is helping those with physical disabilities. Coming to Spain, I was very interested to see how the country has approached these issues and what solutions they have provided. Also, I wanted to pose the same questions to the camino. In America, handicap accessibility is something that goes unquestioned, as it should. Almost every building and city haw some aspect that allows the mobility of persons with physical disabilities. This is not the case from what I have seen so far in Spain. Many of the cities and towns here are very old, and in the olden days handicapped people were not looked upon as valuable members of society. Therefore, providing then with the means of practical mobility was not necessary. This has reflected into the towns and cities of modern Spain. The cobble stone streets, and very tall stair cases all pose nearly impossible obstacles to handicapped people. I could not imagine using a wheel chair in many of these crowded, bumpy streets. 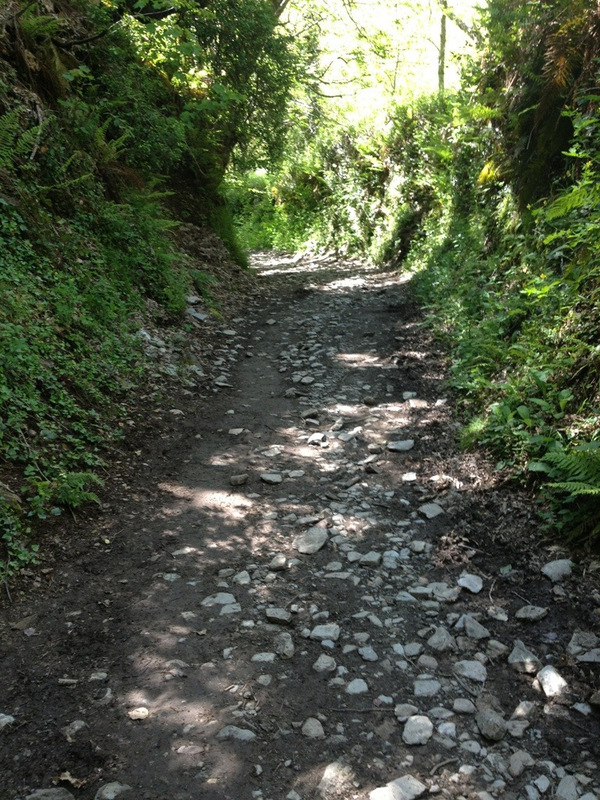 On the Camino, the trails have basically all been impossible for handicapped people to travel on. The albergues also didn’t have any elevators or ramps for them either. I have only seen one albergue thy said it was handicap friendly. This disregard to people with handicaps is unjustified. We have the technology to provide the same abilities for these people who can’t do it themselves. With Industrial Design, we can face these problems and find Suriname to help these people. Wheel chairs can be designed to handle the cobble stones and rough terrain. Ramps could be installed in stores and buildings. Elevators and lifts could be placed in albergues, or handicap albergues should be built with in certain distances along the camino. The history of the country is beautiful and should be protected, but not to the extent that members of our society have to e excluded. The only thing I had ever been skeptical about this trip was the people I would be hiking with. Considering we’d all be together for 5 weeks straight without a day to spare, I was hoping they’d be at least tolerable. After 4 days of being on this trip, there are no words to describe how close we’ve become in the short time we’ve known each other. There’s something about being a Hokie that is so unique and specific to our VT community. No matter where we are, whether in Blacksburg, or hiking el camino in Northern Spain, we, Hokies, always carry our 8 principles with us. 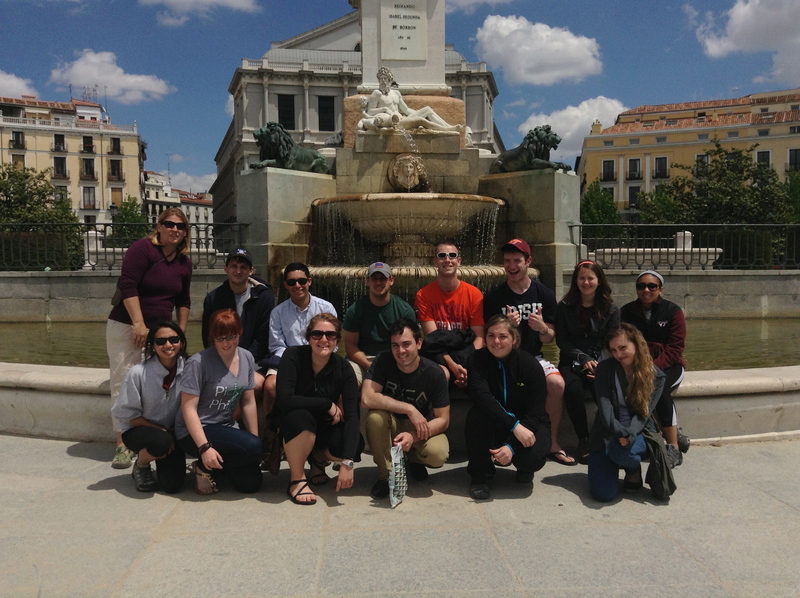 Every single person in our camino group has already made a tremendous impact on our trip thus far. First, there’s Dom–who can simply be described as The Life of the Party. His bubbly personality and never ending energy serves as an endless motivation for the group to get up each morning at 6 a.m. to start our trek. Then there is Coryn and Mark, our dubbed parents of the group. Both recently graduated making them the oldest, and in most cases, the wisest of the clan. Then there’s Jack, who always has a smile on his face and always in the best of spirits. Anna and Christina are probably the quietest of the group and most definitely the sweetest. They’re calm personas balance out our crazy, happy-go-lucky crew. Alec is so awesome because he’s so relaxed and easy going, and then will just crack random jokes out of no where. Erin is definitely our in-group medic. She ALWAYS has supplies for whatever and is one of the most laid-back, easy going people in our group. Jesse serenades us before we go to be in his deep tenor, all-district voice, which is the perfect lullaby to lead us into siesta. Kendal is the baby of the group, the youngest freshman here. She ALWAYS is giggling about something but she’s adorable so she’s totally allowed to. Then there is Cam, who’s been my partner in crime since day 1. We’re always cracking jokes and almost get along TOO well. Her facial expressions are the absolute greatest. Ethan, a rising senior in architecture, is maybe the best thing since sliced bread. Such a easy going, flat out fun person. He’s so mature yet knows how to have fun and when to wind down. Last but not least, our group leader Annie and her loyal helper, Rachel. I couldn’t have imagined a more fun, energetic, and brilliant group. Rachel is by far the most genuinely kind person I’ve met in so long. She’s your right hand whenever you need her and just an overall awesome person to have here. Annie is full of so much knowledge about everything “Camino” and has so much wise advise to offer us whenever need be. 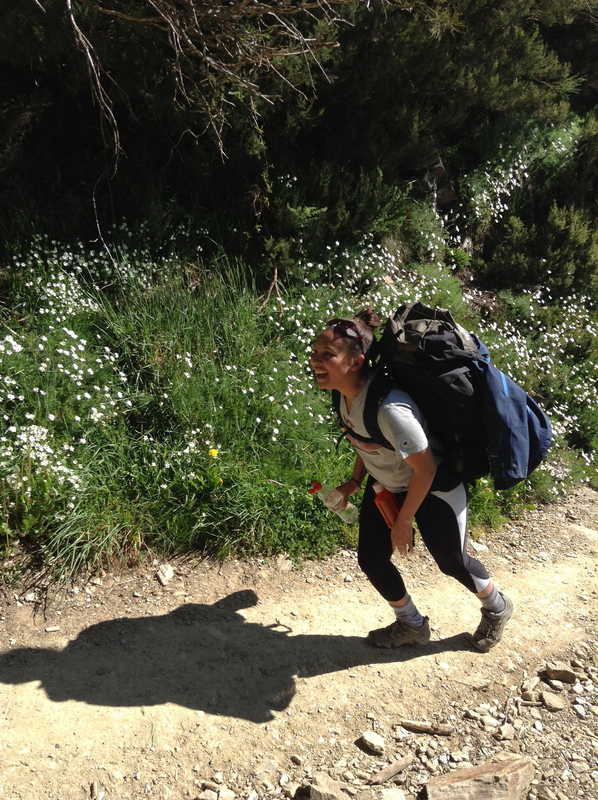 Her passion for studying abroad and the camino is shown through her class she instructs and interactions with her on the trail. She’s the absolute perfect balance between chill and a second mom.